We are a small training and breeding German Shepherd kennel, dedicated to the continuation and improvement of select German bloodlines of the German Shepherd Dog. Our aim is to promote the total GSD, both in structure and temperament. The German Shepherd Dog is the most popular breed in the world, famous for its intelligence, loyalty, and guardian instincts. Being a German Shepherd Dog breeder is a huge responcibility, because the expectations are so high. I'm commited to the German Shepherd Dog, it is my calling and profession, and I'm delighted to share this with you. I spent more than 20 years researching the breed, it's bloodlines, strengths and weaknesses, history and current development, as well as training and showing dogs. 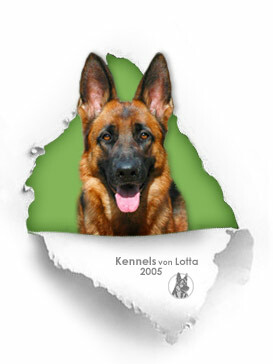 If you would like to know about my background and also why the name of my Kennel is "von Lotta," click here. I know that breeding quality dogs is much more than just putting two dogs with good pedigrees together. Each litter has to have a purpose, and each breeding pair should complement each other in more than one way. To know and understand what is it I'm trying to improve with each breeding, I must stay current and participate in shows and working events, and travel to Germany often, as it is after all the "Mecca" of the modern GSD. Also, along with knowledge of genetic inheritance of different characteristics I have to have a certain "feel" for it in order to be a successful breeder. The German Shepherd breed is far from uniform, as there are German and American, show and working, and other bloodlines, as well as lines with different characteristics within each of these bloodlines. Also, there is no perfect dog, and every breeder has to decide - what are they breeding for? You can breed for show success, for grip-work and points in working competitions, for stable temperament for service work, for specific colors or size, or other physical traits. Here at KvL we breed first and foremost for a healthy dog with stable, self-confident temperament that is very eager to play and to spend time with you (strong pack drive). Basically, I breed dogs whose personality and intelligence I truly enjoy. They are dogs that can be trained in a very wide variety of tasks, as well as I have to have a beautiful dog. My dogs are driven and trainable, with excellent harmony of build and dark pigment. They are a pleasure to have in the house, to take swimming, to play ball with, to participate in any type of "dog-sport" with, and they also succeed in shows. I of course love to win, yet I will not let the desire to have that show winner be the only driving force behind my breeding choices. It has to be the whole dog, and I'm very stubborn and diligent, and will look far and wide for dogs that fit these criteria. Therefore, I make sure to choose our breeding dogs carefully. Sometimes it takes a year or two to find that special dog to add to our breeding program. Along with considering many characteristics mentioned above, in our kennel we do our best to follow the SV standard of breeding, and for good reason. Every breeding German Shepherd Dog in Germany has to have certified healthy hips. Every breeding German Shepherd Dog in Germany has to have a Schutzhund or Herding title that assures sound working temperament. Prior to getting a Schutzhund title, every dog must pass a Temperament Test (BH) - a test to verify stable temperament among strangers and traffic, and an obedience test. Every breeding German Shepherd Dog in Germany has to pass an Endurance Test (AD), which includes a 12 mile marathon. Every breeding dog has to have a Körung evaluation - where the dog's temperament and structure are thoroughly examined. Körung also includes a courage test. Every dog that is awarded a “V” (Excellent) rating at a show must meet all of the requirements described above and demonstrate an excellent structure and movement at a show, along with passing gun-sureness test. To get a VA rating (Excellent Select) the dog must meet all of the above requirements plus must have at least a SchH 2 title and posses outstanding structure. The VA rating is only awarded at the Sieger Show (a yearly national or world championship) where hundreds of German Shepherds compete. All of these strict requirements have been applied for many generations of dogs by German Shepherd breeders in Germany. Most of the World’s best and winning dogs are in or from Germany. We believe that giving the right start to the puppies is extremely important from day one. Our German Shepherd puppies are born in our home, and we love to spend time with them and socialize them extensively. They are weaned on all natural raw diet and are under our constant supervision. We hope that you enjoy browsing our web site, and if you have any questions or comments, please do not hesitate to contact us.